No list of 2017’s most-anticipated games would possess any credibility if it didn’t prominently feature Prey. With Arkane Studios – of Dishonored 2 fame – at the development helm and Bethesda Softworks on publishing duties, it has an impeccable pedigree – and that's before we get into the 2006 first-person shooter of the same name which it's drawing inspiration from. 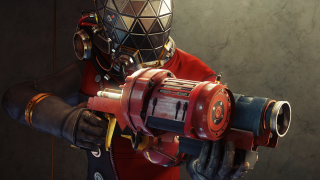 Ahead of Prey’s May 5 launch, we managed to play through the first hour or so of the game. While that precludes us learning anything remotely definitive, first impressions were very promising indeed. Prey’s action starts with a choice – the character you play has the unisex name Morgan Yu, so you must decide whether to play as a man or a woman (we chose the latter). After pottering around Morgan’s futuristic apartment – the game is set in 2032, following an alternative timeline in which John F Kennedy wasn’t assassinated and the US and Russia joined forces to conquer space – it’s time to jump into a helicopter and go to work at TranStar, a giant company which has put a space-station called Talos I in orbit. The chopper ride reveals a fine-looking future-San Francisco. Could Prey be one of the best PC games of 2017? Clearly, Morgan is being prepared for a stint on Talos I, so you’re subjected to a slightly bizarre aptitude/psychological test, after a brief encounter with your brother, Alex Yu. Alas, there’s no way to describe what happens next without unleashing a major spoiler: towards the end of the test, it all goes a bit The Truman Show. The TranStar employees conducting the test are set upon by smallish, wispy-looking black aliens (you’re later told that they are called Typhon, but everyone calls them mimics). Security are called to deal with the attack, and you’re hit with knockout gas. You wake up in your apartment, at which point, you discover you aren’t really in San Francisco but are actually already on Talos I. Everyone seems to be dead, but at least there’s an artificial intelligence called January to guide you. Donning your spacesuit, you step out of your apartment to find a dead engineer, who yields a wrench: your first weapon. A sort of extended tutorial introduces the game’s key gameplay mechanics one by one. Your first objective is to get to Talos I’s lobby. The space-station has an agreeably Art Deco take on interior décor, which chimes with Arkane Studios’ love of a cyberpunk aesthetic. On the way you come across things like the “helicopter” you took earlier – in reality, a simulator rooted to the floor – and your first environmental puzzle. You can smash glass with the wrench to open new passageways, but to reach the lobby you must open a new passage by calling the lift, which reconfigures the film set-like architecture. Along the way, you discover dead bodies, from whom you can loot items, and the workstations of various TranStar employees, which require passwords if you want to read their emails (some of which are more assiduously hidden than others). On reaching the lobby, you’re introduced to one of the game’s key mechanics. You can inject yourself (apparently in the eye, which is cutely depicted) with liquids that enhance your abilities. Later in the game, once you’ve opened up the Neuromod abilities tree, you’ll get access to the likes of the aliens’ shape-shifting attributes. There are three branches to that tree: Scientist, Engineer and Security. The latter lets you increase health and enhance combat skills; Scientist to improve scientific skills; and Engineer gives you the ability to repair things like control panels as well as, presumably, gain greater control over the turrets you begin to encounter, which you can pick up and which will automatically shoot aliens. You also begin to accumulate weapons: we found a rather tasty shotgun plus the GLOO gun, an interesting piece of kit which gobs out an immobilising foam that hardens, so it can be used to freeze aliens, allowing you to finish them off with the wrench. Not only that, it can also put out fires and temporarily stop electrical sparks and can build platforms from which you can reach otherwise inaccessible areas. A perfect use case came to us came to us a few minutes after the demo told us we’d reached its end, we managed to access the Security area (for which we didn’t have a keycard) via a duct after building a GLOO-platform. We also discovered a Fabricator, into which you can put the junk you accumulate (like banana peel and burnt-out electrical circuits), for it to recycle into objects like health-kits – presumably, as you progress, you’ll become able to use it to make ever more sophisticated items. Since you’re alone on Talos I, a bit of robotic company will be pretty handy, and we found a dispenser which disgorged a Medical Operator – a hovering robot which could heal you. We would expect to accumulate all manner of similarly useful objects during the course of the game. In common with Arkane Studios’ general ethos, Prey feels like a game where a typical first-person shooter approach won’t get you far. In its initial stages, it’s all about accessing new areas – for which you can take a detective-style approach and hunt for clues as to where to find the requisite keycards, or you can study the environment and work out how to sneak in through more imaginative routes. Even in the game’s early stages, we encountered two different types of aliens, and the tactical use of machinery like turrets will clearly become key. There were some fascinating snippets of back-story to pick up from terminals and voice-recorders, and we’re expecting Prey’s lush visuals (clearly created using a much more modern engine than those of Arkane Studios’ most recent game, Dishonored 2) to be matched by a rich and quirky storyline. In general, Prey feels much more accessible than Dishonored 2 – it has a simpler, more intuitive control system, with a selection wheel allowing you to flip quickly between weapons and abilities, four of which can be mapped to the D-Pad. However unlike Dishonored 2, it doesn't put too much of an emphasis on stealth – which will please those who don’t possess the patience of a saint – but it still aims to give you the tools to play it in a number of different ways, which should prove interesting when you encounter some more elaborate puzzles than were evident in its initial stages. Our first taste of Prey was extremely promising, but annoyingly tantalising – it immediately felt like an inviting and intriguing game, and we craved more time with it. But at least none of us will have to wait too long: it’s due to go on sale on May 5. For a look at what Arkane Studios have achieved in the past, check out our Dishonored 2 review.